In this tutorial , I will discuss IEEE 802.1X Port-Based Access Control Using Authentication from Cisco Secure ACS 5.X using dynamic VLAN assignment.The basic idea behind the standard is to authenticate and authorize before a user can connect to the physical or logical port of a Layer 2 device in order to gain access to VLAN or WLAN infrastructure. In one of previous tutorials i.e time-based access restrictions, we discussed use of Authorization Profiles. 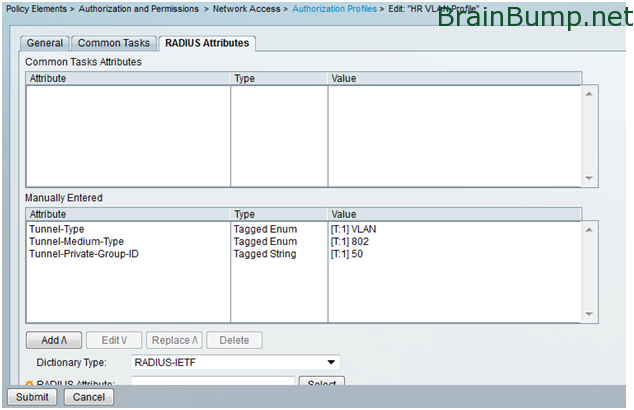 In this tutorial, we would see how we can configure above listed RADIUS attributes in an authorization profile for Dynamic VLAN assignment. First two attributes i.e. Tunnel-Type & Tunnel-Medium-Type will be same in an Authorization Profile. Last attribute Tunnel-Medium-Group-ID will be assigned appropriately for each dynamic VLAN assignment i.e. Next, Configure an Authorization Profile for each group i.e HR VLAN Profile (VLAN 50) & ACCT VLAN Profile (VLAN 51 ).